If you decide to try breeding and raising Belgian Hares, be prepared for a challenge! Some people have said that you have to throw out all you know about breeding rabbits when you go into Hare raising and use a whole new system of rules, but I assure you that you will need to use all the knowledge and experience that you have to be successful with these beautiful and graceful creatures. You will find that many problems you will experience will be as a result of the Belgian Hare's more excitable temperament than other breeds They can react to unexpected events in the rabbitry with a fury that can move cages off their supports, dislocate joints, and break bones. This is compounded by the fine bone structure and extreme length of the animal which seems to invite broken backs and legs. Also, this nervous nature seems to complicate breeding, because, in many cases, fright and panic get in the way of normal mating urges. Most important, this nervous temperament seems to translate normal events in the life of a Hare to an overall stress level that can compromise its auto immune system and open the way to bacterial and viral diseases. Perhaps, this nervous tendency came for past breeding attempts to make the Belgian hare more like lepus Timidus which was suppose to be so fearful so as not to close its eyes even in sleep (Wilkins 1896). Although you might be led by these remarks that breeding Hares in an impossible endeavor; that is not true. You only have approach your breeding and raising activities with one thing in mind: maintaining a peaceful, serene, and healthy environment for your hares, and with a little luck and skill, your nest boxes can be filled with grand champions. If you have a house full of unruly, noisy kids, you probably will be better off with Doberman Pinschers than Belgian Hares. When you bring your Hares home from the airport (if you had them shipped in) or from a show where you may have purchased them, it important that you quarantine them for a week or two. This quarantine has several important purposes. First, you need to observe the newcomers for a while to be sure they don't have any diseases that can be spread to your rabbity. Second, you need to "decompress" the newcomers from the high stresses from shipping, handling, and the introduction into a new environment. During this period of high stress, the Hares are more susceptible to pathogens, both those to which they already have some degree of immunity and to new ones. This decompression period involves just leaving them alone: don't handle them, don't let the kids play with them, and don't try to breed them. Third, during the quarantine period, the new Hares will slowly introduced to pathogens in your rabbitry that they may not have developed immunity to. Finally, ask for a small supply of the feed that the Hares are accustomed to and feed this to them initially. Gradually mix in greater proportions with the feed you normally use over a period of several days. If a hare should refuse to eat, try feeding oats (whole or crimped) or greens until its appetite returns. I have never seen any rabbit refuse wild raspberry leaves. Belgian Hares are constantly on the move, especially when you are around, performing their graceful ballet. Therefore, for both the animal's benefit and for your enjoyment of it graceful movement, you should provide a large cage with at least 24 x 48 inch floor. The floor should be solid (not wire), because the 1/2 x 1 inch wire most commonly used for flooring will not adequately support the Hare's front feet and can lead to broken toes and toe nails. These solid floors should be bedded with a layer of clean and bright straw, shredded computer paper, or whatever is available in you area. I prefer clean oat straw. 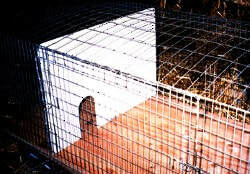 The cage should be high enough to allow the Hare to stretch and leap; 24 inch height should be adequate. Breeding/brood cages should be larger, say 30 x 60 inches, to allow the doe to move around adequately without trampling her brood. It is important to remember that you need to able to reach the back corners of the cage for cleaning. Proportion your such that you can do this without putting you head and shoulders into the cage. Cleaning and sanitation will be less onerous of you -follow this advice! Automatic watering system fonts or ball point water bottles should be placed high on the side of the cage to encourage the animal to stretch. Some breeders will place a board 6 inch high across the floor in the middle of the cage to force the hare to leap over it as it moves about its cage. Both these things are thought by some to enhance the development of the animal for the show table. Some breeders use "corrals" or "runs" built on the floor of their barns to provide housing with adequate exercise space. This method has the advantage of low cost and ease of cleaning if properly designed. The sanitation requirements of Belgian Hares do not differ from that of any other breed. Cages should be cleaned every 5 to 7 days and all bedding replaced. At the same time, feeders and water bottles or crocks should be washed and sterilized. As with any rabbit breed, ventilation should be adequate, but without drafts. If you can smell ammonia when you enter your barn, either sanitation or ventilation (or both) is inadequate. Belgian Hares are no less susceptible to extreme heat than other rabbits. If you live in a location where the temperatures get above 90, you will have to be prepared to keep them cool or lose them! They seem to be able to cope with temperatures down to 0 F if provided with ample bedding and shielded from the wind and snow. However, the Belgian Hare doe's short hair is scarcely in adequate supply to line the nest box sufficiently to keep her bunnies warm. To avoid losses during kindling in very cold weather, it would be advisable to have a warmed space available for kindling. When the bunnies grow a good thick coat in 4 to 6 weeks,they can be slowly introduced to the cold outside temperatures. Unexpected noises or voices seem to startle the Hares excessively and can set off a panic in the barn that can lead to injuries. A radio playing loudly 24 hours a day or a noisy exhaust fan seems to accustom the Hares to noise and avoids these panics. Classical music, mostly Mozart, seems to work for me, but I'm sure that it makes no difference to the Hares. Before throwing open the door to the barn, its always good practice to talk to your rabbits or make some noise to announce your arrival so that they will not be surprised by your entry. 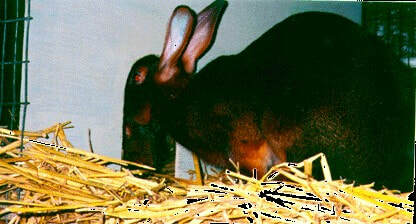 Belgian hares do not have any special feed requirements. Use a pelletized "complete" feed that is readily available and known for its consistency. Do not overfeed Hares. If you allow them to become fat, they will do poorly on the judging table and the does will have trouble conceiving. About 1-1/2 small tuna fish can-fulls each day seems to be about the right amount for seniors. Breeding Belgian Hares Breeding Hares can be a real puzzle. Different bucks and does react to the breeding situation differently. You have to be prepared to adapt your breeding practices to the Hare's preferences as you discover what these preferences are. Remember that Belgian Hares, like all rabbits are induced ovulators; a doe can conceive at any time she is bred. However, the doe has a 10-14 day receptivity cycle. During her receptivity period she will accept the buck readily. A receptive doe can be identified by the dark pink, moist, appearance of her private parts. If you have a receptive doe to breed, by all means, try placing her in your buck's cage first, but watch them carefully. In many instances, the buck, the doe, or both animals can become so upset by the appearance of the other Hare, that they will either attack (and you will have a real fight on your hands) or retreat to a corner and cower. In either case, nothing will be accomplished. If you're lucky, the buck will mount the doe and complete his business with dispatch. I have never had only limited success with "forced breeding" of non receptive does; however, I have found this technique useful with receptive does under other circumstances, e.g., when a smaller doe is not able to support a larger buck during breeding. An excellent description of the "forced breeding" technique is presented in the ARBA Guide Book. A method of breeding used very successfully by some breeders is the "honeymoon cottage." In this method, a large cage, at least 60 inches long is partitioned into two parts with a plywood wall. The smaller part should be about 18 inches long, and the larger, 42 inches. The plywood wall should have a 6 inch round hole through it at the doe's shoulder height. A clean, sterilized cage should be used so that there are no other animal odors on it. In other words, the cage should be "neutral ground." I usually place cardboard over the smaller part of the cage to darken it, and bed both side with lots of straw. I place both the buck and doe in the cage together. At first they will chase each other around; back and forth through the hole. After a while, the doe will discover that when the buck's amorous advances became too much, she can defend her territory, i.e., her side of the cage, by standing with her head in the hole. I leave them together for 10 - 14 days. After a while, both buck and doe seem to get along very well, eating and drinking together peaceably. They will mate when both buck and does are ready. After 10 - 14 days I remove the buck. I keep cleaning out the larger part of the cage, leaving the cardboard covered smaller part alone. After a while, the doe will make a nest on the floor of the darkened, smaller, part of the cage. Then comes the hard part. After making sure that there are no dead kits in the nest I let the doe and her litter alone. I clean the larger part of the cage regularly, but I try not to upset the doe so that she jumps repeatedly through the hole. You don't want her to trample her kits. After about 14 days, the little Hares will be leaping through the hole to get to the pellets. The plywood wall can then be removed and the cage thoroughly cleaned. I have found that the "honeymoon cottage" works with some of the most stubborn breeding pairs. I usually wean the litter at about 8 weeks by removing the doe. The litter can be left together for up to 4 months or until you see the bucks trying to mount the does. Then you will have to separate the sexes.